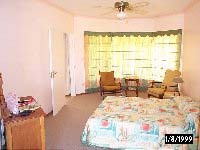 Enjoy luxury accommodation and exquisite meals prepared to your taste whilst experiencing the Kalahari. There is a magnificent view from the guesthouse's stoep. Fill your day with the peace of a crisp sunrise, bird and game watching, magnificent sunset and pure nature. 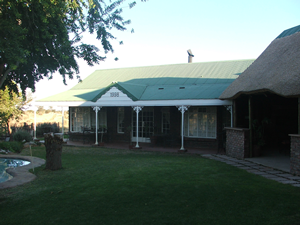 Experience a variety of game and birds at the waterhole a mere 80m from the stoep. 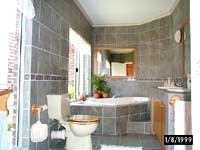 Luxury, two bed roomed (ensuited) guest house with lounge and open verandah. 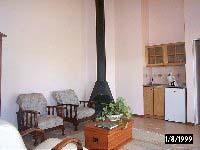 Cuddle up at the cozy fireplace on cold winter evenings or enjoy the abundant sunshine and 'splash' pool during our hot summer days.